French auteur Jean-Luc Godard had said "all you need to make a movie is a girl and a gun". If you consider British filmmaker Danny Boyle, all he needs is a man and a boulder. And like Aron Ralston, whose hand is trapped by a boulder, you will find yourself trapped in your seats - thankfully not for 127 hours, but just for the 94 minutes of the film. Aron (James Franco) is the loner with a penchant for extreme sports. He goes off hiking to Grand Canyon but a little accident causes his right hand to get trapped between a bounder and a solid rock wall. He tries to get it free and after five odd days with his food, water and energy out, he has no option but do the unthinkable - to try and cut his hand off before he slowly starves to death. It was easy for Godard to say what he did, but try making a film like that and you know how tough it is, especially to keep the audiences glued to the seats. Thankfully Boyle has many tricks he has used in delightful films like "Trainspotting", "Millions", "Sunshine" and his Oscar winner "Slumdog Millionaire". He uses multiple split screens, dreamy flashbacks, bright hallucinations, macro photography, film speed variation and quick zooms. He thus travels not just within and outside his imprisoned character, but into his past and future, while giving you a macroscopic view of his surrounding present. This heightens his incarceration and claustrophobia. It was definitely not an easy film to make, and it isn't an easy one to watch. A few scenes will make you squirm so bad in your seat, as if you too are a prisoner there. Thankfully the Indian censors have been intelligent enough to let the scenes be. Without them the film would have lost its impact. James Franco proves himself to be an actor with reckoning. After the immature "Spiderman" to the mature "Milk", he transcends himself as the man trapped not just by a boulder but by his own selfishness. 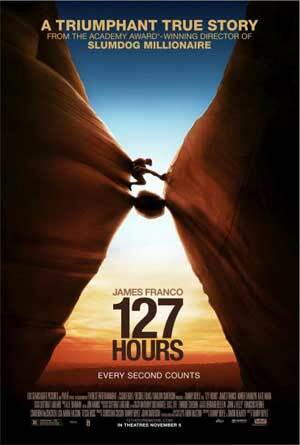 The 127 hours trapped by the side of the rock become his time to not just question his life but to find a possible resolution to it, a meaning. One thing Franco and Boyle tell us is to pause a while in our life, lest our life speeds past us. You don't have to be trapped for 127 hours under a boulder or go to a 10-day silent Vipassana to do it. You can pause your life daily to reflect on it. "127 Hours" is a film, as Aaron discovers, about the choices we make in life. Your life is a sum total of your choices made or not made. And your entire past has conspired to bring you to this moment. For Aaron it is a moment that will lead to his death-trap. Obviously he regrets the choices he made that led him here. This 127 hours-long near-death experience leads him to inspect his entire life, and his motivations and through his hallucinations and desire to give up, he finds the strength to do the unthinkable to not just survive, but for once in his life, really live.